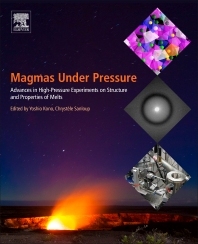 Magmas under Pressure: Advances in High-Pressure Experiments on Structure and Properties of Melts summarizes recent advances in experimental technologies for studying magmas at high pressures. In the past decade, new developments in high-pressure experiments, particularly with synchrotron X-ray techniques, have advanced the study of magmas under pressure. These new experiments have revealed significant changes of structure and physical properties of magmas under pressure, which significantly improves our understanding of the behavior of magmas in the earth’s interior. This book is an important reference, not only in the earth and planetary sciences, but also in other scientific fields, such as physics, chemistry, material sciences, engineering and in industrial applications, such as glass formation and metallurgical processing. Yoshio Kono is a beamline scientist at a synchrotron X-ray facility (HPCAT at the Advanced Photon Source) in the USA. He manages an X-ray experimental station for high-pressure studies of melts. He studies structure and physical properties of not only magmas in Earth science but also liquids and amorphous materials in physics and material sciences. He received Ph.D. in environmental and natural sciences at Yokohama National University, Japan, at 2006. Chrystèle Sanloup is a professor of Earth sciences in Paris (Sorbonne Université), France. Her main interests are the chemical and physical properties of geomaterials at the extreme pressure and temperature conditions found in planetary interiors. She is specialized in in situ X-ray synchrotron based techniques, in particular for the measurement of melts properties. She received a PhD in Universe Sciences at Ecole Normale Superieure de Lyon, France, 2000.